A member of the groundbreaking rock band Nirvana, Krist Novoselic, along with band mates, Kurt Cobain and David Grohl, changed the course of music history when they snapped up Billboard Magazine's number one spot with their much-acclaimed album Nevermind. In doing so, Nirvana opened the doors for a flood of a new generation of bands. After Nirvana, Novoselic went on to become one of rock's most politically-minded musicians. Novoselic has also committed himself to numerous different community projects and has become an influential part of the Northwest political scene. In 2004, Krist did a national book tour with FairVote, promoting his book "Of Grunge & Government: Let's Fix This Broken Democracy!" In the book, Novoselic discusses how Nirvana emerged as the world's biggest band of the early 1990s, how he got involved in politics and why we need electoral reform -- in particular full representation and instant runoff voting. The tour was well-covered in the media, including taping by C-SPAN and an interview in the New Yorker. 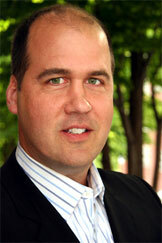 Krist joined FairVote's Board in 2005 and was elected chair in 2008.